CBS had everyone's two favorite redheads: Lucille Ball and Carol Burnett, whose Carol Burnett Show proudly shared the network's call letters as well as its commitment to family entertainment. But you don't survive for eleven seasons (1967-1978) simply on good intentions. Carol and her partners in comedy -- Harvey Korman, Vicki Lawrence, Lyle Waggoner and Tim Conway -- had amazing skills beyond securing the big guffaw. Grand musical finales and classic movie spoofs became fast favorites among regular viewers, and different guest stars each week - a who's who of music and comedy including Ruth Buzzi, Roddy McDowall and Gloria Swanson -- added fresh faces to the mix, giving the cast every opportunity to flex comedic talents. Yet, the show all came together around the amazing Carol, who never failed to delight, to entertain, and to let us know that she was glad we'd had this time together. The Carol Burnett Show: Together Again gives fans both old and new an opportunity to savor some of the most acclaimed and beloved moments from this landmark variety show. The single DVD features 3 UNCUT episodes, as they originally aired on television, and showcases "The Family," with Eunice, Mama and Roddy McDowall as brother Phillip; hilarious movie parodies "High Hat" and "Raised to Be Rotten"; and, long-running sketches "The Old Folks" and "Carol and Sis." Episodes include #705 (Original Airdate: September 29, 1973), #712 (Original Air Date: December 15, 1973) and #1115 (Original Air Date: January 8, 1978). The Carol Burnett Show debuted on CBS in 1967 and ran for 11 years, receiving 25 Emmy Awards and five Golden Globes. Time Magazine named the program as one of the "100 Best Television Shows of all Time" and Carol Burnett has been honored with more People's Choice Awards than any other actress. 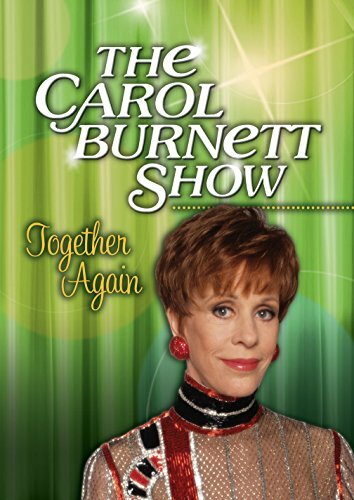 And, in September 2012, StarVista Entertainment/Time Life initially debuted four different configurations of The Carol Burnett Show, including the widely acclaimed 22-disc ULTIMATE COLLECTION which featured 50 episodes, more than 20 hours of never-before-seen bonus material and a 20-page memory book (newly released at retail), as well as 6-disc sets CAROL'S FAVORITES and THIS TIME TOGETHER, the holiday-themed CHRISTMAS WITH CAROL and a single disc and 2-disc versions of THE BEST OF THE CAROL BURNETT SHOW. Since the series' StarVista debut, they've sold more than 6 million units, assuring that The Carol Burnett Show will live on for a new generation of fans. Running Time: 2 hrs., 38 mins.